I think it would be fair to say that part of the reason Thomas & Reggie can get along is that Thomas treats him better than he earns. They are also very similar, personality wise, except their goals are more or less opposite. This is a generalization, obviously, and also I have insight into their personalities that you as a reader do not, but still… Thomas is the more sympathetic character of the two, but he’s no angel. Likely the main reason he’s nice to Reggie is that he’s using him. That said, Thomas can also see more of what makes Reggie human by being able to tolerate delving past his outer layers of jerk and getting to his soft jerk underbelly. I suppose that could be rewarding over time. If nothing else talking to Reggie helps sate Thomas’ almost pathological need to advise. He certainly needs guidance, even if he’s unlikely to listen. “No need to apologise for insulting me” is what I assume the next line will be. The problem with insulting someone like Reggie, is they need to first understand what an insult is. I figure Reggie’s mind is so far into his own world that he doesn’t process an ‘insult’ the way normal people do. To him, he probably thinks you’re complimenting him. The impenetrable wall of Jerky-o? Also, Soft Jerk Underbelly would be a great name for a band. AAAHHH! Completely disregardant confidence… if only he ACTUALLY had the intelligence to go with it. Tsk, tsk…. Actually maybe I shoukd be counting…. HMMMmmmm…. Heh, the first one i had to wait for, and i am happy to still be a fan :D. Great work on the new comic. Thank you. I’m happy you’re still a fan too. Hear, hear. Or is it “here, here”? Ah, heck with it. 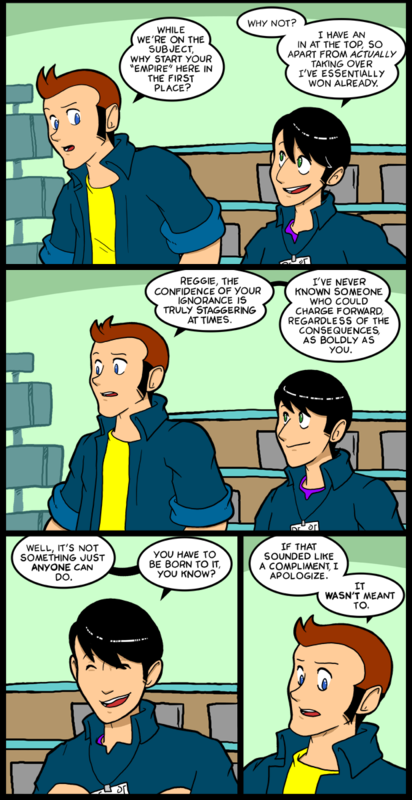 On the comic itself: I’ve met people like Reggie. Even had to work with some of them. Pretty tough when they’re a soldier in the same unit and you can’t possibly avoid them for several weeks. Can’t possibly as in they’re even in the same platoon (Swiss platoons are usually sized 25-35 soldiers, depending on their role) and dorm room. And trust me: They only get worse when deprived of sleep! True that. And not exactly a reassuring thought. Here’s one even worse: Today’s such people with someone in at the top (if high enough) somehow tend to end up in politics. At least more often than one would like them to do so. Trouble of course being here that many people won’t recognize the true nature of these guys from just the few media statements they hear of them (which sound nice) and discard any criticism they hear as pure propaganda and lies. And now we have one as a President. Hey what happened to the long haired Carol pic? It was sweet. It’s in the blog section someplace. I’m not sure if that part of the site is working or not anymore. Confidence comes in a tampon box, doesn’t it? I’m strangely happy that I don’t know, or really even understand this comment. All Megatainment shirts are part polyester, so he’s dicked. Should I feel distressed that this conversation is becoming more familiar to me? This comic should distress you all the time. It’s almost as if it’s hard for Thomas to be a snarky as he would like to be towards Reggie because it might not have the intended effect. Like how his insult is is interpreted here. So he’s like why bother? I’ve actually known some people like Reggie. They’re actually quite rewarding to talk to if you know the trick. Oh, you want me to tell you the trick? As much sarcasm as possible. People like Reggies are easily confused by long sentences, especially with double negatives. It’s good practice when you want to find ways to insult people to their faces. Inside everyone is a heart of gold–cold, hard and yellow. Although I appreciate your effort to turn around the “Heart of Gold” saying, your attempt is severely lacking in reality. Your description of gold, while technically in line with some of the qualitative properties that gold has, is lacking the key aspects that make gold what it is. Most notably is that Gold, being a metal, is lustrous. That’s another way of saying is shiny. It’s reflective. All metals have the property of being lustrous or semi-lustrous. It’s caused by the same thing that defines them as a metal. If gold weren’t shiny it would be, in every meaningful sense of the phrase, just a rock. So while I commend you for the attempt, I feel I must point out some facts that are glaringly obvious to me. Your description, while not very accurate for gold, is quite accurate for solid elemental Sulfur. Besides, a heart of sulfur would make you point much more pointy. Sulfur is brittle, easily tarnished*, and smelly when it’s hot. In addition to being cold, hard and yellow. Another detail that I consider to be worth pointing out is that an actual heart, that is, an actual, human, heart, is (once you get past all the various other things that obstruct your view and get some good light on it) Yellow**. Besides, by the standards of anyone who isn’t used to separating organs from their organisms and viewing them on their own, a human heart is downright ugly. It’s all squishy and bulbous and it writhes when it’s working. In fact, if you open the myocardial sack (protective skin around the heart) and expose it to open air while it’s pumping, it makes the most unsettling squishing sound as in moves back and forth. Basically, what I’m saying is that even without comparing a living heart to a lump of mineral, it’s not very hard to make a case that hearts are disgusting. Such is biology, when it comes down to it. Finally, I have two last bits of nit-picking to do. Gold is neither cold, nor hard, by any quantitative standard. It is, in fact, one of the softest metals. And the majority of non-metals attain comparable or better hardness if organised into similar crystalin structures. A prime example is carbon, which forms a sort of odd diamond in that structure. And it’s a common misconception that metals are cold. A metal plate and a wooden one at room temperature feel like they’re at different temperatures to the touch. Which is a misleading piece of information. The human body tends to be an average of around 25-35 degrees Fahrenheit above room temperature. The nerve endings in your skin sense changes in temperature and localized differences in temperature, more than anything else. But wood is porous and made of non-metals. It is far less thermally conductive than any pure, solid metal. And at room temperature, everything else s colder than you are. So when you touch a piece of metal (that is colder than you are), it conducts heat away from your body much faster than wood or other organic materials, causing a spot on your skin that is colder than average for your body and colder than the surrounding skin, which has nothing to conduct heat away from it besides air. The nerves in your skin decide that what you’re feeling is colder than what you felt when you felt wood. This may all seem to mean nothing when you consider that hot metal still feels hotter than cold metal and hot wood still feels hotter than cold wood. “How can you really tell the difference,” you might ask. Here’s the difference: when both are colder than your body, metal feels colder. When both are at the same temperature and that temperature is higher than that of your body, however, the direction of heat flow is reversed so the hot metal will feel hotter than the hot wood. Again, this is simply because the heat is moving from the hot place to the cold place faster for the metal than for the wood. Note that this does, in fact mean that it’s easier to burn yourself on hot metal than hot wood. Similarly, it’s harder to get your tongue stuck to a pole in cold weather when the pole is made of wood, rather than metal. You should consider this an important lesson in the physics of heat, even if it isn’t 100% relevant to your original post. * Technically, “tarnished” doesn’t accurately describe the effect of Sulfur’s reactivity, since the word only actually applies to things that started by being lustrous and then became dull, but it does make my point rather well. ** Well, that’s not entirely fair. It has a layer of protective fat around it which tends to absorb and store certain nutrients which make it yellow. The actual muscle isn’t yellow. Cocksure ignorance is an amazing thing to run into. It allows the holder thereof to do stunningly stupid things and when combined with an ability to unknowingly sidestep the disasters incurred also can be a horrific liability to anyone working with them.